Most of us can remember a time in our childhood when we were so painfully shy we couldn’t bear to be in the spotlight. 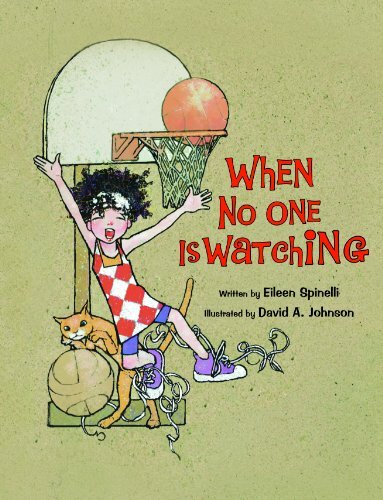 That is the theme of author Eileen Spinelli’s new picture book, When No One Is Watching. In the book, a young girl is explaining her “double life:” how, when no one is watching, she leaps and spins, she’s brave and adventurous, and she even cheers loudly for herself as she dribbles a basketball and dunks it into the hoop. But when everyone’s watching she shies away into a corner instead of leaping, shrinks away from neighborhood kids who want to play games, and passes the basketball to a popular girl instead of trying to make the basket herself. Just like the quote, “dance like nobody’s watching,” the girl gives example after example of all the wonderful things she can do when no one is watching versus the way she shrinks into herself when all eyes are focused on her. When No One Is Watching is cute, relevant, and even touching as it connects with young children who may be struggling with the concepts of acceptance, self-confidence, or belonging. It even resonates with adults who remember what it was like long ago to have to conjure up the courage to be themselves in front of others. The book is done up, start to finish, in a beautiful speckled brown tone that is soft, warm, and oddly comforting. Artist David A. Johnson’s illustrations capture sweet expressions and spot-on body language with a precision sure to bring a smile to the reader’s lips. From the young girl’s jubilant dancing and twirling when nobody’s watching to her wide-eyed, bashful “I-don’t-want-to-be-seen” posture when too many eyes are focused on her, Mr. Johnson manages to pull on the heartstrings and inspire the reader to root for that day when the little girl finally emerges from her fragile shell. This book is a perfect addition to a preschool bookshelf with teachers helping young students to identify and cope with feelings of shyness and uncertainty. Also a wonderful lap book for a home library, When No One Is Watching can be used as a great story-starter for introverted or isolated children—and those who know and love them anyway.